I am now part of a small group making Artist Trading Cards, or ATCs. They are one of my favorite things to create and I have a collection of over 200 so far. I've made them with fiber and fabric, collage, drawing, using markers and really just experimenting. 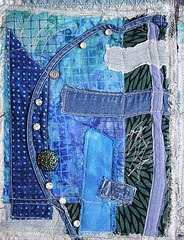 Here's the blog, this month's theme is sky, and I've posted my ATCs there.